Read below for some helpful tips from HGTV on how to update your countertops. Prime the entire surface with 100 percent acrylic primer. “You want a flash-bond primer, one that will stick to the laminate and that will allow paint to stick to it,” says Stephen Ingerson, color specialist for Hirschfield’s, Inc, who suggests XIM primer, Benjamin Morris Fresh Start, Bullseye 1-2-3 or any other high-quality primer that says on the label it’s intended to cover gloss or high-gloss surfaces. When the second coat of primer is dry, paint over it with a couple of coats of latex satin or semi-gloss enamel, allowing each coat to dry before painting another. After the finish coat is dry, seal it with a couple of coats of clear acrylic. If you’ve kept up with the latest trends in real estate you may already be familiar with a strategy known as “white-boxing.” Under usual home buying/selling circumstances both parties are familiar with the staging of homes listed on the market–fully furnished, complete with a fresh coat of paint, and/or updated fixtures and flooring. White-boxing means everything is completely removed from the home to appeal to the buyer’s imagination, a blank canvas if you will. The strategy allows prospective home buyers to start from scratch–dreaming up numerous layout possibilities and floor designs. Check out this link to Better Homes & Gardens’ step-by-step tutorial on how to build your own decorative divider wall for any room in your home! Time flies and next thing you know it’s 2 more weeks until Christmas! If you’re reading this and haven’t yet adorned your home to welcome the upcoming festivities of dinner parties, gatherings and gift opening, click below for tips on how you can decorate your house in fast and budget-friendly ways! What Does Color Have To Do With Anything? Did you know that one of the causes of roof leaks is ICE DAMS? 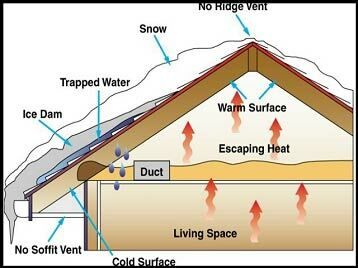 Generally, ice dams (ridges of ice) form at the eave’s edge, as well as in the valleys. The ice prevents the melting snow from draining off the roof. The water that backs up behind the dam can can leak into the home, causing damage to ceilings, walls, insulation and other areas. Shingle Shopping? What Are the Choices?